The biggest difference I've seen between our culture and the international cultures that I've had the opportunity to visit, is the value that they place on relationships, far more than Americans do. It's interesting when really thinking about that. The less people have - the more they value one another and the more they help one another and the more time they have to give to others. As I worked this morning just making sure I have all the projects for the coming weeks in the proper order on my calendar, I worked with the intention of being very organized so I could focus on everyone around me this weekend. Preparing for the 988th service since I've been involved at Crossroads, I asked the Lord - what do you want from me? What do I have to offer and bring to the ministry this weekend? I realized by being very organized and preparing well - I could give time and attention, perhaps the greatest thing anyone can give. 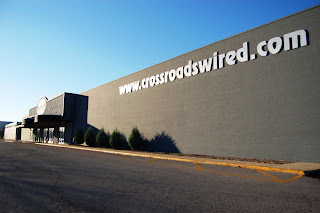 I'll never grow tired of coming to Crossroads and totally trusting that God is going to do something amazing again, and again, and again, despite us! I look very forward to talking to as many of you as possible this weekend - and I encourage you, spend a little time preparing even if you're not directly involved in the services and I bet God will meet you there!